Last week I suggested that he should chose the Rockets over returning to the Los Angeles Lakers. Why? It’s because Houston is a better fit for Howard than LA. And I am not only talking about a better BASKETBALL fit. I’m talking about a better emotional fit as well. Playing for the Lakers requires a special type of player – a player that does what it takes to deliver a championship. A player who is able to block out the distractions from the media and focus on his craft. A player who is never afraid of big stage and the storied championship history of the Los Angeles Lakers. Magic Johnson fit that mold. So did Kareem Abdul-Jabbar, Jerry West, Shaquille O’Neal and of course Kobe Bryant. Not Howard. Howard left LA because he wanted to take the easy way out. He did not want the pressure of delivering a championship to the Lakers. He did not have the stomach to be the face of a storied franchise after Kobe retires. Hell, he did not want Kobe to show him how to become a champion. Let’s face it, Howard was never going to cut it in LA. He has the emotional fortitude of a mustard seed. Besides, Houston is not the media monster that LA is. He will be a big fish in a smaller pond (similar to his Orlando Magic days), and will not be as pressured to win in Houston as he would in LA. He’ll be surrounded by better players – namely James Harden and Chandler Parsons – and have a better support system in coach Kevin McHale and former Rocket great Hakeem Olajuwon. Now that he chosen the Rockets, Howard is running out of excuses. It was never his fault in Orlando. It was never his fault in LA. Is Howard finally going to maximize his awesome talent and deliver a championship to Houston? Will he man up to the challenge? Given Howard’s history, I’d be surprised if he does. 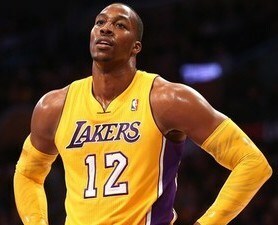 I don’t think Dwight Howard was afraid, I just don’t think he wanted to be a Laker. At least not while Kobe is there. Let’s face it, the Lakers are an older team, their roster doesn’t fit the system their coach wants to run, and D’antoni doesn’t have much job security right now. Also, Howard and Kobe were not on the same page. Why try and force fit it? I think Kobe saw Dwight Howard as a subordinate, and not as a partner. Yes, Kobe has a championship pedigree and Howard doesn’t. But if you want to recruit talented players to help you win more championships, I think the best approach is to offer a partnership, as opposed to an offer to teach them. All of these are good points Klownboy, but there were other reasons why he left. 1. Like MB said, Kobe doesn’t understand that it’s time to let someone else be the lead dog. His role should be 2nd option and elder statesman. Kareem let Magic take over in ’87 and they got two more titles. Doc let Moses do the heavy lifting and he finally got his ring. 2. The Lakers are an old team that’s way over the cap. It will be three or four years before they can put a championship team behind Dwight. 3. He didn’t really leave $30 mil on the table. California would have eaten half of that since their tax rates are significantly higher. Texas has no state sales tax. Also, the child support laws are much for favorable to high income unmarried Dads in Texas. I understand that this would also be extremely beneficial to Mr. Howard.